If you use your WordPress website to sell upcoming events, you’ll need an effective way to display them. While you can use a dedicated WooCommerce events plugin, this may weigh down your site – which is the last thing you’ll want. Instead, you can use the WooCommerce Product Table plugin to list events in an attractive and clearly organized way. This plugin is lightweight, easy to use, and very customizable. Plus, the product table you set up will make it simple for customers to see all their options and purchase tickets. In this post, we’re going to show you what this type of WooCommerce events page might look like, and how it can benefit you. Then we’ll walk you through how to set one up. Let’s get to work! 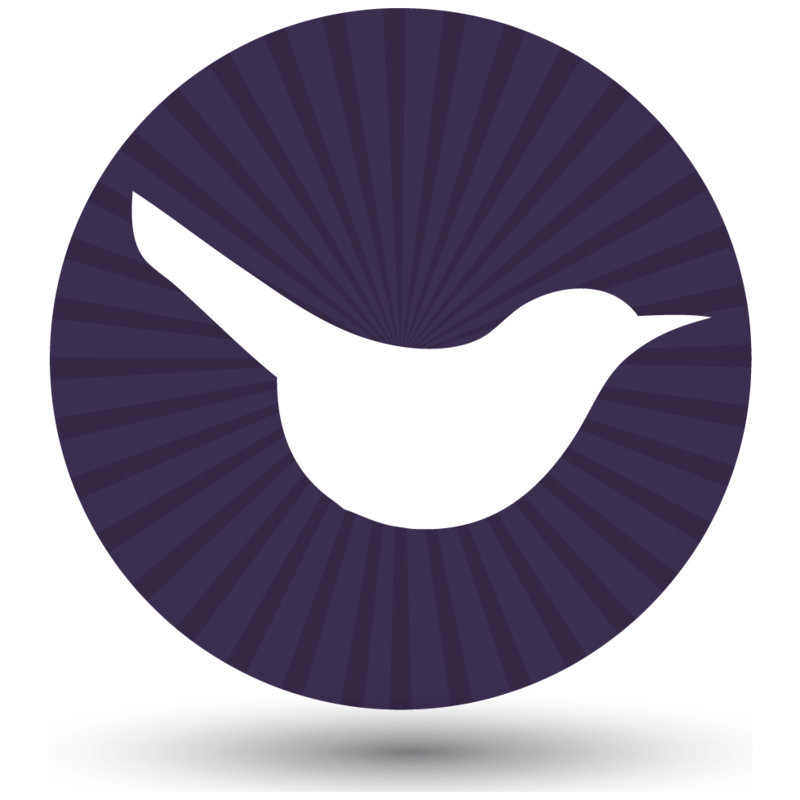 See it in action on our WooCommerce events list demo page. A WordPress website is a fantastic way to showcase events and gather an audience for them. You can promote them to existing customers and new visitors, provide all the information they’ll need, and let them buy tickets or make reservations online. What’s more, you can use WooCommerce to create an events website quickly and easily. This will let you set up a dedicated page (i.e. a product) for each event. However, that does mean visitors will need to navigate through a lot of different pages to see all your WooCommerce events, which isn’t ideal. The default WooCommerce store layout simply isn’t appropriate for selling courses or events. The solution to this problem is displaying your WooCommerce products as an organized list of events on a single page. You can include the essential information about each event, providing visitors with what they need to make a decision without overwhelming them with details. They can quickly search and filter the list of events to find what they’re looking for. Plus, they’ll be able to make comparisons easily, choose the number of places they want to book, and even purchase tickets to several events at once. An easy-to-use plugin for listing WooCommerce products and events in new and flexible ways. This plugin lets you create a product table organizing all your WooCommerce events into one place, and including whatever information you like about each one. It’s a fantastic way to peak your visitors’ interest and encourage them to sign up for more events. And if you want to use WooCommerce Product Table with an events plugin, that’s fine too. Just skip ahead to find out how. Now let’s see what a lightweight list of WooCommerce events looks like in action. Here, you’ll find a well-designed WooCommerce events product table. 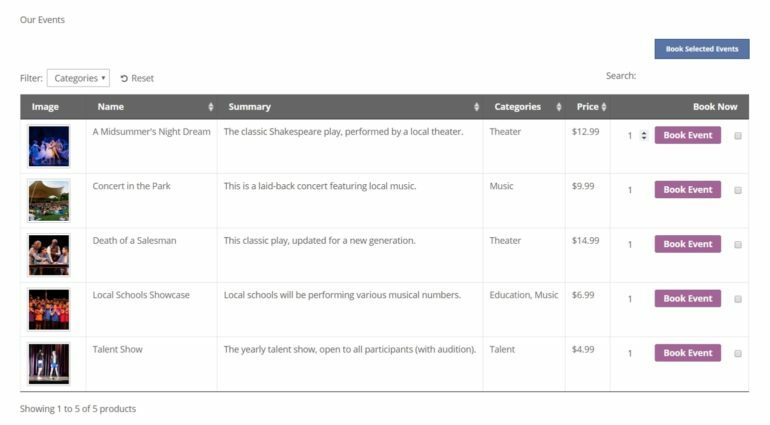 Each event is listed on its own row, along with key details such as its description, category, price, and even a featured image. Customers can scroll through the table to see all the events on offer, or use the filter at the top to sort the table by a specific category. This helps them find what they’re looking for more quickly. They can also click on each event’s title to visit its dedicated page, in case they want more information. When a visitor knows what event they want to see, they can use the quantity selector to choose how many people will be attending. Then, they can click on the handy Add to cart button to make their purchase. If they’re interested in multiple events, they can even select everything at once using the checkboxes under the Buy column, then use the Add Selected to Cart button at the top of the table. You may want to visit this site yourself, in order to try out the table and get a better sense for its functionality. Then, come back here to learn how to create your own WooCommerce events page! Set up a WordPress website to promote your events (if you haven’t already done so). Install WooCommerce on your site, and run through its simple setup wizard to get it configured. 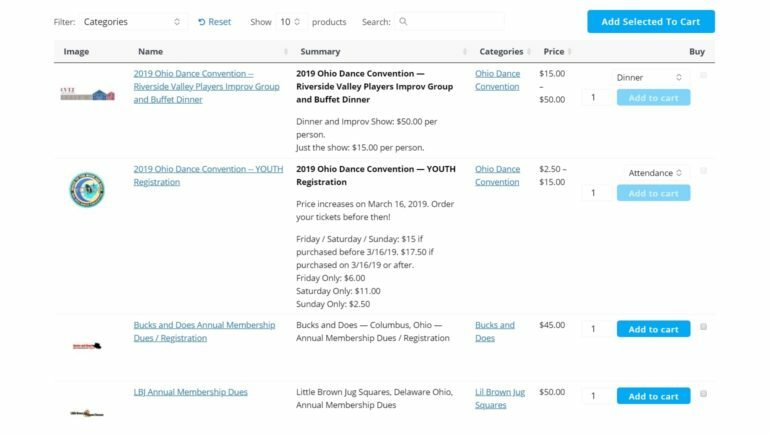 Enter each individual event as a WooCommerce Product, including all the information you’d like displayed in your events table. Create custom fields for displaying any extra information about each event, such as date and time. You can also add product variations, or even add-ons to sell extra options and collect information about each attendee (e.g. type of ticket, dietary requirements, etc.). Once those three tasks are checked off your list, you can follow the simple steps below to display your WooCommerce events effectively. The end result will look similar to our events list demo page. Naturally, the first thing you’ll need to do is get your hands on WooCommerce Product Table. Buy WooCommerce Product Table here! Here, enter the license key you were given in your purchase confirmation email. 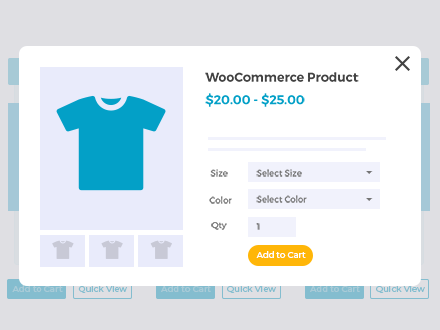 This will get WooCommerce Product Table fully set up on your site. Classic Editor – Click the ‘Insert Product Table’ toolbar button. This adds a [product_table] shortcode to the page. Gutenberg – Add the [product_table] shortcode to a ‘Shortcode’ block. You’ll see a shortcode added into your page. This is a small snippet of code that tells WordPress to display a product table wherever it’s placed. It will automatically apply any settings you’ve configured as well (more on this in the next step). It may look a little bare-bones right now, and some of the labels used don’t quite make sense (for example, the Buy column will need to be renamed). However, don’t worry! Next up, we’re going to show you how to customize your WooCommerce events list. At this point, save your new WooCommerce events page as a draft. You may want to keep it open in its own tab, so you can refresh it to see the effects of the changes you’ll be applying. Then, navigate back to WooCommerce -> Settings -> Products -> Product tables. On this page (where you entered your license key earlier), you’ll find lots of settings that let you customize exactly how your product table looks and functions. You can check out all the options in the plugin’s documentation, and find instructions for how to configure them. Here, you can list out each column you want in included in your table. Try to strike a balance between providing all the necessary information, and not overwhelming your visitors. For an events table, we’d recommend the following columns at a minimum: image, name, short-description, categories, price, and add-to-cart. Right below that, you’ll definitely want to check the Quantity selectors box. That way, if people want to bring along friends or family to the event, they can reserve multiple places at once. If you choose Button and checkbox, customers will be able to purchase tickets for more than one event at a time, and add everything to their cart with a single click. This is a smart way to streamline their experience. You may want to select Show based on columns in table here. 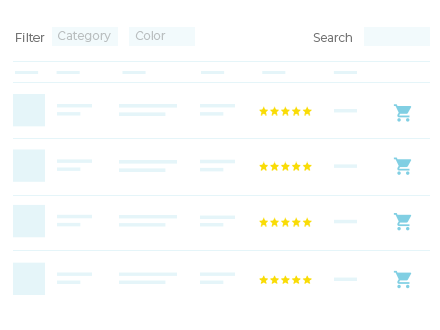 This will place one or more drop-down menus above your WooCommerce events table, like the one we saw for categories on Weave The Ring earlier. Especially if you offer more than a few events, this makes your page much more user-friendly. This same method will work for any column you want to rename. You can also change the label for the button that will appear above the table, enabling customers to ‘purchase’ more than one event at a time. Simply find the ‘Add Selected to Cart’ text field, and rename it something like Book Selected Events instead. Install and activate the plugin on your site, and then navigate to WooCommerce > Customize. There, select WooCommerce, and then Add to Cart Buttons. There, you can include any text you’d like to use for these buttons in your events table. Don’t forget to hit the Publish button when you’re done. You can continue to customize your product table settings as much as you’d like. When you’re done, simply publish the WooCommerce events list page. Visitors to your site will immediately be able to use it to reserve their spot in your upcoming events! So far, I’ve shown you how to list events in WooCommerce with all the information and purchase options in a table. If you want to display extra information that won’t fit neatly into a table option, then you can send customers to the single product page for each event. However, this loses momentum and makes the customer less likely to book multiple events. It’s better to keep them on a single page while they’re choosing their events. If you want to show multiple images from previous events, you can show the full product image gallery in a quick view lightbox. This really brings the event to life, making people more likely to book a place. There are 2 options for how to display the image gallery (thumbnails or bullet navigation). Customers can buy product variations directly from the quick view popup. For example, they can choose different ticket options for each event and add them to the cart. You can show extra information such as the event short description and price. Can I list WooCommerce events in a table even if I am using an events plugin? So far, we’ve talked about how to sell events without using a WooCommerce events plugin. Of course, you can use an events plugin if you really want to – for example, if you need extra functionality. And even better, you can still have the neat table layout that I’ve just told you about! WooCommerce Product Table – use this if your courses or events are actual WooCommerce products. For example, this will apply to you if you’re using the Events Calendar plugin and want to list tickets rather than events, as these are WooCommerce products. Similarly, you might be importing events into WooCommerce products from a third party system such as Moodle. Posts Table Pro – use this if you’re using an events plugin that has its own custom post type for courses and events. For example, plugins such as Events Calendar and Event Espresso create their own post type. You can list these events in a table with our other plugin, Posts Table Pro. Read our full tutorial on how to do this. Either way, you can still have the same fantastic table layout for selling your WooCommerce events. 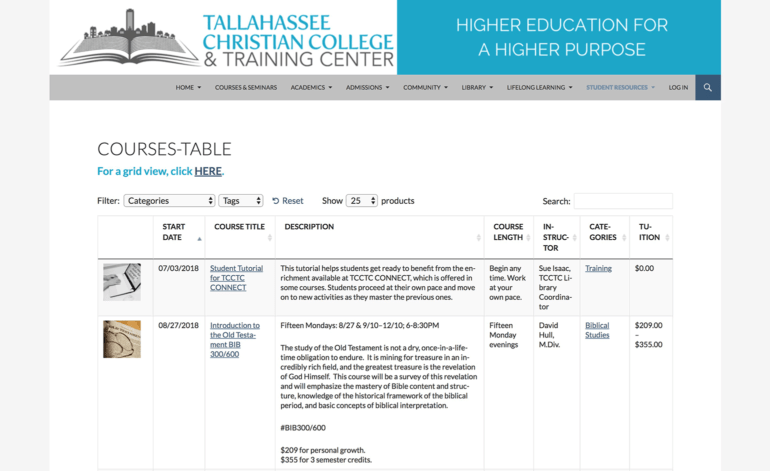 Tallahassee Christian College and Training Center use WooCommerce to register for their higher education and training courses. They use the free Edwiser Bridge plugin to integrate their WordPress WooCommerce website with Moodle, automatically importing their courses as WooCommerce products. They use WooCommerce Product Table to list the courses in a table layout. Students can quickly filter the table by category or tag, and click through to the single product page to register. Selling access to events on your website is a little different from offering regular products or services. While installing WooCommerce is a good start, its default product pages aren’t as user-friendly as they could be. Fortunately, there are much better ways of displaying your WooCommerce events. Purchase and install the WooCommerce Product Table plugin. Create your WooCommerce events page. Configure your WooCommerce Product Table settings. An easy-to-use plugin for listing WooCommerce events in new and flexible ways. Do you have any questions about how to set up the perfect WooCommerce events page? Ask away in the comments section below! So I think it makes sense to use the product data table if events are.shown in a chronological order starting from the closest one. Hi Alex, the plugin comes with 'Sort by' and 'Sort order' options which let you choose to order the table by date or any other field.